Charming and contemporary, the Helsinki breakfast bar stool in charcoal grey is securely set out to make your morning coffee your favorite time of day. Fixed at the finest height the Helsinki bar stool emphasizes the elegant shapes of this kitchen stool. 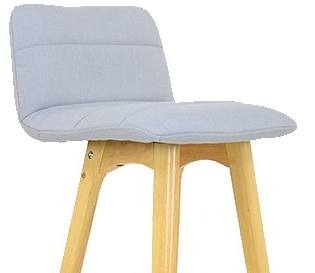 This breakfast bar stool is cushioned for ultimate comfort, the padded seat is upholstered in a mixture of fabrics for a tantalizing texture. This Helsinki charcoal grey bar stool will create a warm atmosphere to your kitchen counter or breakfast bar area. Helsinki Wooden Bar Stool Charcoal Grey Fabric.